Winter Session, Spring Semester, Summer Session....I've been in school since January 3rd of this year but as of this morning at approximately 10:15am, my summer arrived. Finally. School has been a great distraction and motivator this past five months but I'm ready for a break. Ready for pleasure reading without guilt. Ready to put my backpack away in my closet for the next 57 days and not have to worry about school. Now there will be time time for visits to the beach, sewing, blog reading, gardening, great conversation, baking, new food discoveries, tomato canning and reading...copious amounts of reading. Add in preparation for a kitchen remodel and this is my recipe for the next 57 days. I'm going to soak up every second. Not only did she send me the potholders she had made with A Stitch in Color by Malka Dubrawsky (and the really cool grommets!) 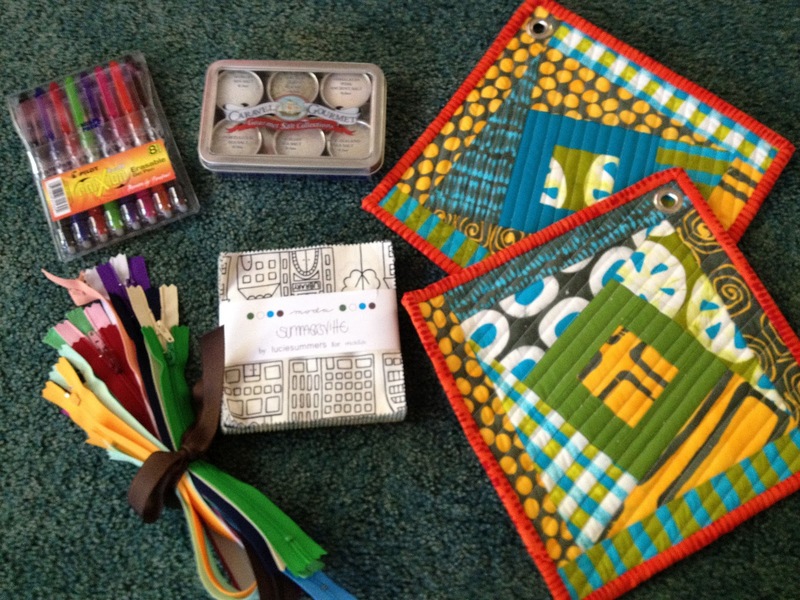 but she added in a charm pack of Summersville, a bouquet of zippers, a palate of Sea Salts (oh can't wait to dive into those) and rainbow of gel pens. I think she is talking to the teacher in me waiting to burst out! Thank you Debbie! 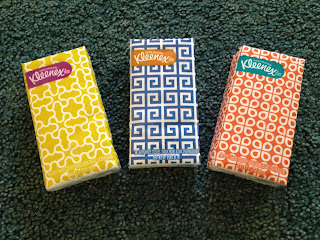 Ok two more things to share: quick trip into Target this afternoon I found these Kleenex tissues at the check out stand. 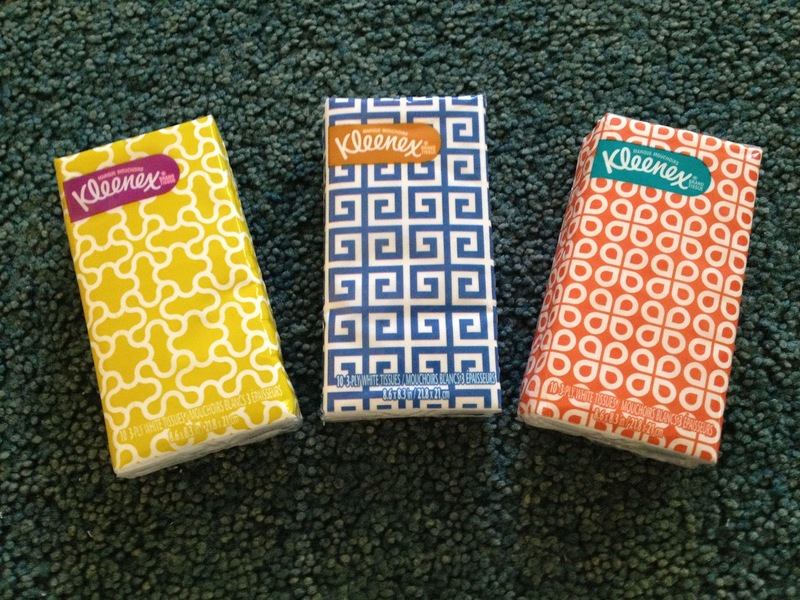 Now don't these look like the perfect tissues for quilters to carry? 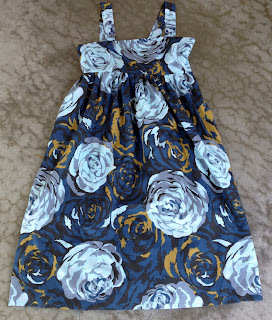 Lastly, this dress. It's a mess. The top just does not fit right (zippers are my nemesis right now) and the whole thing makes me look like a house. Empire dresses are so deceptive - they look so cute on the models and then look about 10 sizes too big on me so the top will be cut off and I'll make this gorgeous fabric into another skirt. Sans the zipper. I'm off to NOT do homework. Way cool prize! Enjoy your summer. Wow! What an amazing prize! I LOVE those Kleenex bags too! Wish we had a Target here. That's the one bad thing about garment sewing... you can't try it on first. It DOES teach you (often the hard way, as you learned) what does and does not look good on you. I think that lesson is very valuable, so maybe the dress isn't good on you, but you'll never have to try on an empire waist dress ever again LOL! Enjoy your break! Sorry about the dress! That stinks, but it will be a really cute skirt! Target has such cute stuff. Have you seen the new quilty-looking mugs and trays and things? 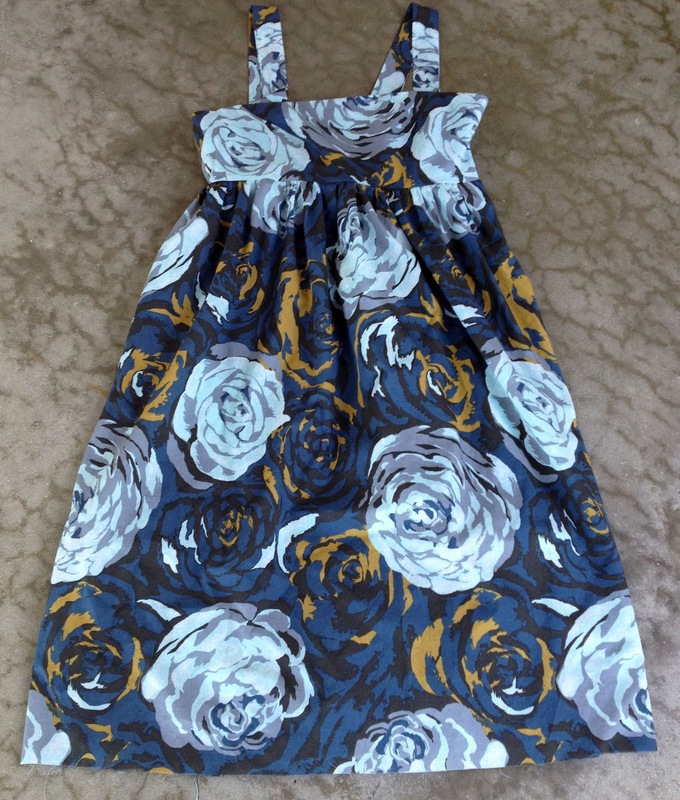 Sorry the dress was a bust, but it will be a really cute skirt! And hooray for summer! !